1 collage : photographs and paint ; 28 x 33 in. 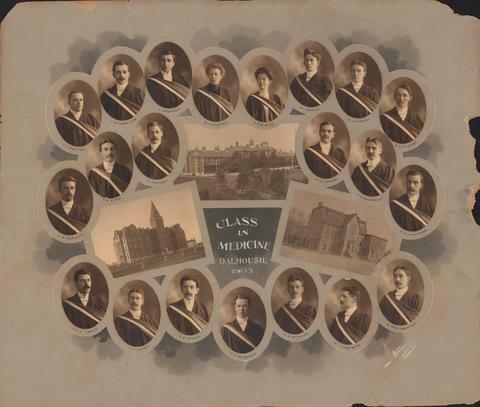 File contains a photographic collage of the Dalhousie University Faculty of Medicine class of 1903. The collage consists of photographs of J. L. Potter; J. C. Morrison; L. Brehaut; M. M. Austen; G. E. B. Rice; M. Coffin; D. Murray; A. C. McLeod; E. B. Norwood; T. R. Ford; J. A. McIver; W. A. Lawson; H. D. Hawboldt; G. W. Whitman; R. W. L. Earle; J. F. Lessel; E. E. Dickie; K. A. MacKenzie; K. A. McCuish; F. V. Woodbury; and D. McN. Crawford arranged on a painted background around photographs of Dalhousie University (now the Forrest Building), the Victoria General Hospital, and the Halifax Medical College. The edges of the item are damaged in several places.